Stryper (which stood for "Salvation Through Redemption Yielding Peace Encouragement and Righteousness"). There have been a few acts who put their Christian beliefs in hard rocking songs, such as Stryper. 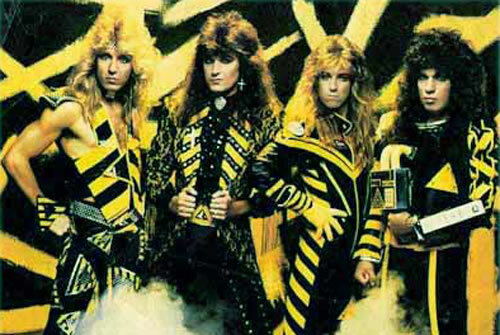 Formed in Orange County CA in 1983, the group was originally known as Roxx Regime, and consisted of singer/guitarist/main songwriter Michael Sweet, drummer Robert Sweet, lead guitarist Oz Fox, and bassist Timothy Gaines.Combining aVan Halen/Def Leppard style, black-and-yellow outfits, power ballads, Stryper was a favorite and signed by the Enigma label in 1984. The same year, the group's debut recording, a six-track mini album titled The Yellow & Black Attack, was issued. The same year, 1985, came the release of their first full-length album, Soldiers Under Command, whic hit the Billboard charts, With it's success came the re-release of The Yellow & Black Attack, with 2 extra tracks and a revamp on the albums artwork. in 1986. Later the same year, Stryper released the bands full-length, To Hell with the Devil, which many consider to be the group's greatest success. Turning out to be the highest-charting album of their career and benifiting from MTV's heavy rotation with , videos like "Calling on You" and the ballad "Honestly", the album went platinum, even thought their christian message was far from the heavy metal norm.